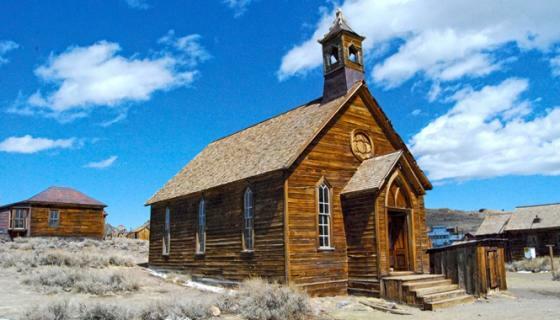 Visiting Bodie is the most authentic way to see the real-life setting of the California gold rush. From 1877 to 1882, Bodie was a bustling town with more than 10,000 residents and produced more than $35 million in gold and silver. Today, with the gold mining days of California a distinct memory with almost 200 abandoned wooden buildings in a state of "arrested decay" to photograph and explore. Peek in the windows of the church, schoolhouse, barbershop and saloon, where bottles, desks and other relics remain. While Bodie is open year-round, the roads to the Park will close with snow. Before visiting, please visit the Bodie State Historic Park&apos;s website, check SR 270 conditions on the Caltrans Road Information website or call our office at 800-845-7922. And, swing by the Bodie Foundation&apos;s Bodie Mercantile store in Bridgeport, CA for Park information, as well as to shop for unique gifts, souvenirs, and more - with proceeds funding stabilization projects in the ghost town! Bodie State Historic Park is open 9am-6pm in summer (May 15th - Oct 31st) and 9am-3pm in the winter (Nov 1st - May 14th), and is best explored in warm weather in spring, summer and fall; peak season is Memorial Day through Labor Day. There is a nominal entrance fee of $8 for adults, $5 for children 16 and under (cash or check only). Pack water and light snacks, as there are no services (restrooms are available). We also recommend bringing sunscreen, a camera and a jacket – even in summer! Bodie is located at a high elevation - 8,375 feet - and weather can be more extreme. There is also limited cell service. For more information, please call Bodie State Historic Park at (760) 616-5040. Bodie State Historic Park of California is located in the Eastern Sierra close to Bridgeport, June Lake, Lee Vining, Mono Lake and Yosemite. 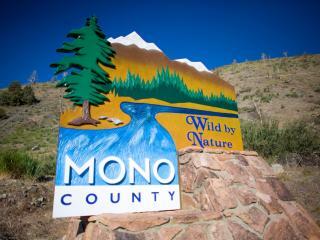 It is located in a remote area accessed by State Route 270, seven miles south-east of Bridgeport. From Hwy. 395 take State Route 270 east for 10 miles to the end of the pavement. Continue three miles on an unsurfaced road. These last three miles can at times be rough and reduced speeds are necessary. Driving precautions: In winter, many four wheel drive vehicles with chains get stuck each year in powdery snow. In Spring, mud can be a problem. Local towing services, when available, can be costly. It is snowbound in winter (approximately Nov. 1st - May 14th), accessible only by snowmobiles, cross country skis, or snowshoes. Sub-zero temperatures, strong winds and white-out conditions are common. Snowmobiles must stay on designated roads in the Bodie Hills. There are no lodging facilities at Bodie, but there is a variety of motels, cabins, hotels and resorts within 20-30 miles in the towns of Bridgeport and Lee Vining. Bodie visitors will want to leave every nail, rock, and stick exactly as they see it. People have been known to experience a string of nightmare events after helping themselves to Bodie souvenirs! 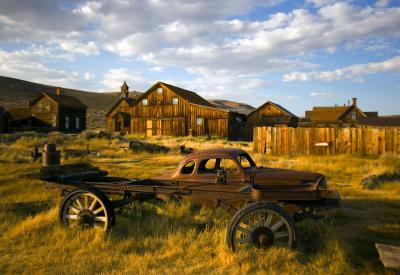 Bodie is one of the best family day trips in Mono County. For visitors staying in Mammoth Lakes, Bridgeport, Yosemite, June Lake or Crowley Lake, Bodie takes about an hour to reach. It’s a fascinating alternative to today’s theme parks and something every kid should see with their own eyes! Friends of Bodie Day is held annually every August. Free Summer Tours of the Stamp Mill and History Talks are offered daily Memorial Day through Labor Day (no reservations required). Photography Workshops are offered throughout the year. Private Tours of the Town, Cemetery and Bodie Bluff Mining District are also available with advance reservations. Info: 760-647-6564.